Owings Mills, Md. (July 26, 2017) — Greenberg Gibbons announced today that the Maryland-based retailer Radcliffe Jewelers has signed a lease for 5,687 square feet at The Shops at Kenilworth, the newly revitalized and renovated landmark shopping destination in Towson, Md. Radcliffe Jewelers is known for its unparalleled selection of new and estate fine jewelry, new and pre-owned Swiss watches, diamonds, china, crystal, silver and vintage handbags from Hermes, Louis Vuitton, and Chanel. 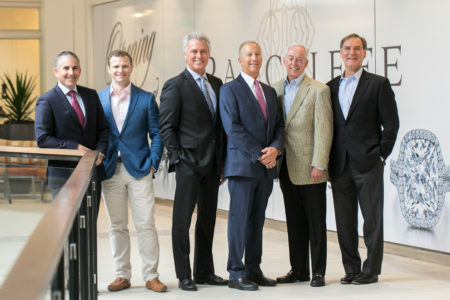 The new location at The Shops at Kenilworth will serve as an official jeweler for Rolex in addition to offering other prestigious brands such as Cartier, Bvlgari, Chanel, Shinola, Forevermark, Marco Bicego, Elizabeth Locke, Roberto Coin, TAG Heuer, Mikimoto, Temple St. Clair, Omega and many more. Expert custom design, appraisals, and repairs will also be available for guests to enjoy. You can learn more about Radcliffe at www.radcliffejewelers.com. Radcliffe Jewelers announces its move to The Shops at Kenilworth. Radcliffe Jewelers will be moving to The Shops at Kenilworth from its current location at Towson Town Center in Fall 2018. It will join an established mix of fashion, beauty and lifestyle retailers, including Trader Joe’s, Ruth Shaw, South Moon Under, About Faces Day Spa and Salon, Jos. A. Bank., Quiet Storm Surf Shop, and ZenLife Yoga. Radcliffe Jewelers’ second location will remain at 1848 Reisterstown Road in Pikesville. The new store will join Trader Joe’s, About Faces Day Spa & Salon, and Ruth Shaw on the second level of The Shops at Kenilworth. The center is in the final phase of its transformation that includes updating the exterior and interior into a more contemporary and welcoming specialty shopping and community gathering place. 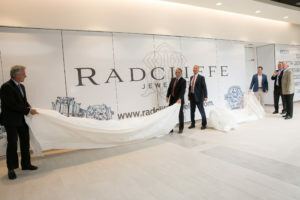 Radcliffe Jewelers celebrates its lease at The Shops at Kenilworth with Greenberg Gibbons. “After careful consideration of all our options it became clear that The Shops at Kenilworth is perfect for us. The combination of a terrific location and a complementary tenant mix is very attractive. We are excited about creating an exciting new store atmosphere for our guests and continuing our longstanding commitment to serving the Towson market,” said John Shmerler, CEO of Radcliffe Jewelers. John Harrington of Mackenzie Commercial Real Estate represented Radcliffe Jewelers in the transaction. Greenberg Gibbons began managing The Shops at Kenilworth in July 2014 and assumed full ownership of the property in April 2015. For more information about the renovation project, visit: www.GGCommercial.com/KenilworthRenovations.